Quebec City has deployed a real-time decision-support system that uses modeling, monitoring, and other measures to regulate flooding conditions for a 100-year storm event. Authors Diana Qing Tao and Martin Pleau of Tetra Tech and Denis Brisson and Nathalie Jolicoeur of the City of Quebec explain how the real-time control (RTC) system provides flood protection. Climate change has resulted in increasingly intense and frequent rainfall events has become a major challenge in terms of urban water management. River flooding in urban areas, especially, has caused harmful impacts on people, the environment, and the economy of a region. All of these reasons have led many municipalities to develop an Urban Flood Control (UFC) Master Plan, the objectives being a reduction of people and property exposure to flood hazards, a reduction of flood damages, a minimization of soil erosion and sedimentation problems, and an improvement of floodplain usefulness. Traditional UFC Master Plans consist of structural flood control measures such as dams, storage reservoirs, dikes, flood-walls, flood diversions, channels, and land treatment practices. Quebec, Canada, has experienced the impacts of climate change as excess stormwater, and flooding has been generated due to increasingly frequent extreme rainfall events, hurricanes, flash floods, and winter flood runoff as well as increased risk with saturated soils. In 2005 and 2013, two flooding episodes in the downstream section of the Lorette River Basin led to sewer backups and the flooding of a dense urban area that caused significant civil and environmental damages. The Basin covers an area of 6800 hectares and includes three main watercourses: Ruis-seau Mont-Châtel, Ruisseau des Friches, and the Lorette River. To plan and address flooding issues holistically to reduce flood occurrences for both existing and future urban development conditions, the City embarked on the development of the Lorette River Basin Stormwater Drainage Plan and subsequent implementation of flood mitigation solutions identified in the Plan. The City recognized that it needed nonstructural measures including flood preparedness measures, flood monitoring and forecasting, and emergency response measures to facilitate implementation and meet its objectives. Both structural and non-structural measures, adequately related in time and space, constitute the cornerstones of the City’ s innovative contemporary UFC Master Plan for flood management of the Lorette River Basin. In particular, the City opted for a real-time control (RTC) solution to regulate flooding conditions for a centennial storm event. The solution involved the deployment of real-time models, measuring de-vices, cameras, and the construc-tion of flood regulation structures, including two 100,000 cubic meter (m3) retention basins along the two main tributary creeks. A real-time decision support system (RTDSS) with forecasting, automated data analytics, and other functionalities was developed and implemented. It has been a valuable tool in the coordinated management of various stakeholders to monitor river conditions, operate, and plan emergency responses. 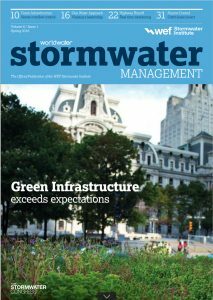 Read more of how Quebec City mitigated its urban flooding on p. 13 in the Spring issue of World Water Stormwater Management magazine.